Floyd McGowin, of the Chapman, Alabama, McGowins, the owners of the W.T. Smith Lumber Company, was born in 1931 and died in 2010, but this memoir takes his story basically up to 1966. At that time, the W.T. Smith Company was sold and McGowin started the Rocky Creek Logging Company and ran it for forty-two years, covered here in an epilogue of only six pages. The Forest and the Trees is the story of his life, but it is also a social history of the times, including race and class relations, a corporate history, and an informed, extensive commentary on developments in private aviation. 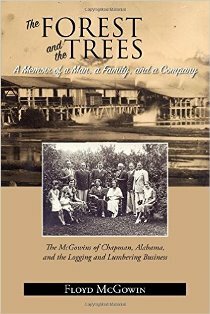 Chapman was essentially a company town; McGowins, Floyd’s father and uncles, owned the company and at one point 221,000 acres. While at Yale McGowin enrolled in the Marine Corps Platoon Leaders Class and, after graduation, went through extensive training at Parris Island, Quantico, and Cherry Point. Already married at twenty-two to Rosa Tucker, with his first child, Norman, born in 1954, he was stationed in Korea where the truce had been signed, but the situation was anything but peaceful. McGowin, a vociferous patriot, also shows himself as a sensitive appreciator of Japanese shrines and Zen gardens on his R&R trips to Tokyo and Osaka. Although he would not be considered a “bookish” person, McGowin did a lot of reading in prep school and the Corps and indeed throughout his life. He writes: “I read constantly and always had a book going….In my mind I was friends with Ernest Hemingway and William Faulkner, Herman Wouk…James Jones…William March…Ring Lardner, Mark Twain, and Sir Arthur Conan Doyle.” Often the reading was connected to the military or flying: Charles Lindbergh, Ernest Gann, Richard Hillary, and Marine Colonel John W. Thomason. “Reading, like flying, remains a passion to this day,” he writes. Even before Yale and the Marines, McGowin already had a pilot’s license. His dream was to become a Marine aviator, but a failed audiology test forced him into work as an air traffic controller, using radar equipment and techniques developed by the RAF in the Battle of Britain. Nevertheless, he would fly his own planes all his life and make inspection from the air an important part of timber management. McGowin constantly took training, upgrading his ratings and adding to his hours. His life’s chief obsession was flying and it is evident. For enthusiasts, The Forest and the Trees can serve as a guidebook to small planes from the 1940s to the twenty-first century. I was hoping for some stories about his uncle Earl’s private railroad car The Finest Hour and his uncles’ sojourns at Oxford University, but this is not their story. The company fought the union and finally prevailed, but only after considerable violence and dynamiting—forty-two blasts in one year, he says—all done by the union. There is no mention of worker grievances. McGowin, refreshingly, shows no hesitation in characterizing his friends, family, and himself. Uncle Earl was “never burdened by false modesty.” While his mother was “warm,” his father was “remote [and] spouted constant criticism,” often “misplaced and mean-spirited,” and sadly Floyd says, “I remember only two occasions when he spent any one-to-one time with me when I was little.” He tells the reader several times his brother Greely was guilty of years of “degrading physical bullying” until finally confronted. McGowin also candidly describes himself: physically strong, smart enough, but filled with insecurity, immaturity, lack of discipline, and an inferiority complex which took years to fight through. After Korea, McGowin worked for decades expanding and modernizing equipment and processes in the lumber business over the resistance of his conservative and parsimonious uncles. Like most memoirists of this variety, he is proud of his work in the industry and of his private life and he has every right to be.